The cute Rufous Tree Rat is a large species of spiny rat in the family Echimyidae, the Neotropical spiny rat family. It is known locally as “ratón espinoso”, meaning spiny rat, but despite this, this species lacks the spiny hairs on its back and rump of other members of the family; rather, it has thick, coarse hair covering its face, body and tail. It is also known as Rufous Soft-furred Spiny-Rat. It has reddish-brown hair, gray head and face, and short, broad ears. The furred tail is shorter than its head and body. The Rufous Tree Rat is found in evergreen and deciduous forests, mangroves, plantations and secondary growth forests. This arboreal rodent is found exclusively in trees, and has never been trapped on the ground. It is nocturnal, and at night moves slowly along tree branches, foraging individually or in pairs, often remaining motionless for extended periods of time, but can climb quickly if provoked. 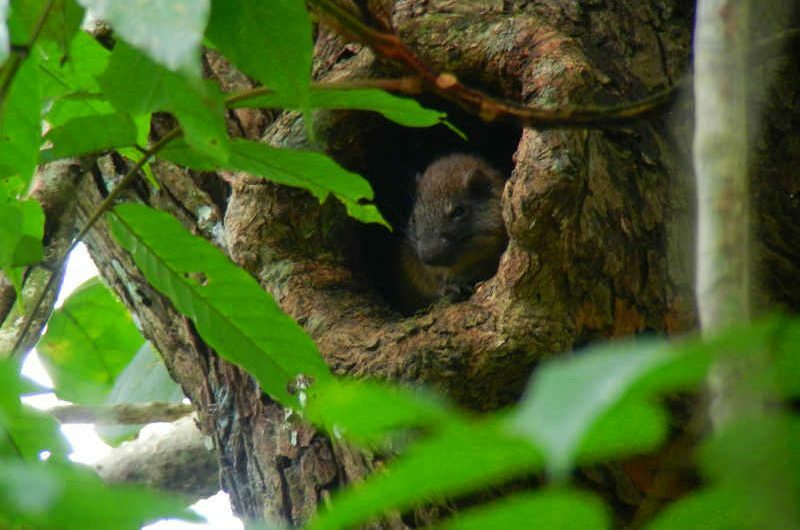 During the day, the Rufous Tree Rat roosts in tree cavities, alone or in pairs, and can occasionally be seen sticking its head out of the hole in view. Rufous Tree Rats are herbivores; they feed on fruits and young leaves. Breeding occurs year round; the female raises 1-2 pups per litter, and the young stay with the mother for up to a year until they reach maturity. The Rufous Tree Rat is found in Panama, Colombia and Ecuador, and has just recently been discovered in the Osa Peninsula of Costa Rica (November 2015). Rufous Tree Rats are locally common in Panama, and can be found around all the Canopy Family lodges. A true rat? Despite being a member of the spiny rat family, the Rufous Tree Rat and its close cousins are more closely related to guinea pigs and chinchillas of South America.